Mein Kampf (German: [maɪ̯n kampf], My Struggle) is a 1925 autobiographical book by Nazi Party leader Adolf Hitler. The work describes the process by which Hitler became antisemitic and outlines his political ideology and future plans for Germany. 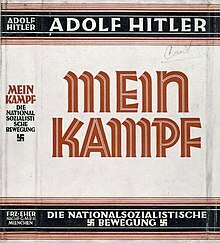 Volume 1 of Mein Kampf was published in 1925 and Volume 2 in 1926. The book was edited firstly by Emil Maurice, then by Hitler's deputy Rudolf Hess. ^ "De wetenschappelijke editie van Mein Kampf - Uitgeverij Prometheus". Uitgeverij Prometheus (in Dutch). 23 August 2018. Retrieved 5 September 2018. ^ a b Eddy, Melissa (8 January 2016). "'Mein Kampf,' Hitler's Manifesto, Returns to German Shelves". The New York Times. Retrieved 8 January 2016. Dietrich Eckart was a German journalist, playwright, poet, and politician who was one of the founders of the Deutsche Arbeiterpartei, which later evolved into the Nazi Party (NSDAP). He was a key influence on Adolf Hitler in the early years of the Nazi Party and was a participant in the 1923 Beer Hall Putsch. Max Amann was a German politician, businessman and a member of the Nazi Party. He was the first business manager of the Nazi Party and later became the head of Eher Verlag, the official Nazi Party publishing house. After the war ended, Amann was arrested by Allied troops and deemed a Hauptschuldiger and sentenced to ten years in a labour camp. He was released in 1953. Amann died in poverty on 30 March 1957, in Munich. Landsberg Prison is a penal facility located in the town of Landsberg am Lech in the southwest of the German state of Bavaria, about 65 kilometres (40 mi) west of Munich and 35 kilometres (22 mi) south of Augsburg. It is best known as the prison where Adolf Hitler was held in 1924, after the failed Beer Hall Putsch in Munich, and where he dictated his memoirs Mein Kampf to Rudolf Hess. 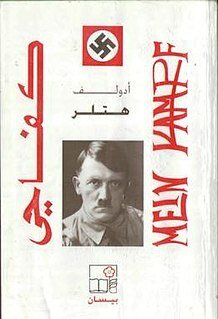 Mein Kampf, Adolf Hitler's 900-page autobiography outlining his political views, has been translated into Arabic a number of times since the early 1930s. Bernhard Stempfle was a Catholic priest and journalist. He helped Adolf Hitler in the writing of Mein Kampf. He was murdered in the Night of the Long Knives. Why Britain is at War is a polemic treatise written by Harold Nicolson and first published by Penguin Books on 7 November 1939 shortly after the Second World War began. In the book, Nicolson explores Adolf Hitler's insatiable grasp for power, the foreign policy brinkmanship and deception ploys adopted by Nazi Germany, and Hitler's use of actual and implied force to get his way at the negotiation table. The Penguin Special edition originally cost 6d and sold a hundred thousand copies. Ever since the early 1930s, the history of Adolf Hitler's Mein Kampf in English has been complicated and has been the occasion for controversy. No fewer than four full translations were completed before 1945, as well as a number of extracts in newspapers, pamphlets, government documents and unpublished typescripts. Not all of these had official approval from his publishers, Eher Verlag. Since the war, the 1943 Ralph Manheim translation has been the most popular published translation, though versions of the others have continued to circulate.